Stepes (pronounced /’steps/) instantly connects you to human translators for voice, image, and text translations you can trust, all from your smartphone. There are hundreds of translation apps on the market, all claiming to be the best. If you do a quick search on Google for the “best translation apps”, you’ll see dozens of recommendations from major publications. It’s next to impossible to sort through the results to find the best app that is most suited for your language translation needs. However, if you are like most international travelers and are in need of a good iPhone or Android translator app that gives you accurate translations you can trust, we invite you to download Google Translate, iTranslate (Voice), and Stepes so you can compare for yourself. Stepes is the only app that connects you instantly to 100,000+ human translators worldwide so you can get everything translated on-demand and with the best quality. Don’t settle for outdated solutions and inferior translations, download the Stepes App today to get the high quality language services you deserve. An overwhelming majority of today’s translation apps use machine translation or automatic language conversion using computer algorithms. As many people have learned (the hard way), using Google Translate or iTranslate can often lead to embarrassment, or worse, confusion – just when you need language help the most. This is why the Stepes app is a game changer. Stepes is the first app to use human translators in major cities around the world to serve all of your on-the-go translation needs in real-time 24/7/365. Have you ever dreamed of having your personal language assistant when and where you travel abroad? Your dream is finally coming true! Next to getting high quality translations you can ask the local Stepes translator for hotel and restaurant recommendations, or information about the transport system. While machine translation is sufficient for snippets of short texts, it is painfully inadequate for a variety of other language translation needs. For example, getting emergency medical help often involves explaining the circumstances and filling out complicated forms. Rest assured that with the Stepes Translation App, your concerns will be received by a physician the way you had intended. There are numerous other instances where human interpreters are best suited for the job such as attending an international business meeting, visiting a foreign bank to open up a temporary account, or getting directions to places you want to visit. Such requirements are beyond verbatim translation which is why only human translators can deliver what you need, with no misinterpretation or confusion – just clarity. Launch the Stepes App and select New Translation. Please make sure to turn on your phone’s GPS or location service for best performance. Select the Talk & Translate feature. This new on-demand Stepes function allows you to speak directly to a translator. The call is done over the IP network so it’s best if you have a fast Wi-Fi connection. It will also work with 4G connections, but may incur additional data usage with your wireless carrier. Select your target language. By default, the target language will automatically set to the official language of the country you are visiting. However, you can overwrite this setting by clicking on the flag to select another target language. Select an approximate number of minutes for the session. This is an estimated time and the actual duration of the session can vary. Selecting a time value will let the translator know roughly how long the conversation may last. It will also allow Stepes to provide you and the translator with an approximate cost. Next, click on the green global talk button to activate the translator search. This will allow Stepes to look for an available translator that is close to your location . You can cancel the call by pressing the button again. Once a translator is found, you will be automatically connected to him or her. You can use the speaker phone or mute functions depending on your needs. The conversation may be stopped at any time by pressing the red phone button. Next, you will see a popup screen showing you the cost for the translation session. 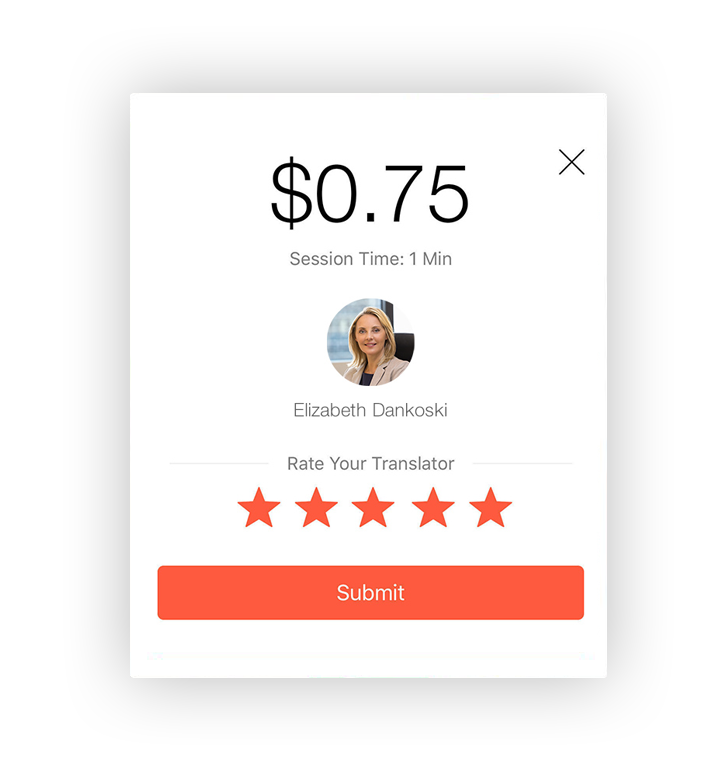 You will also get a chance to rate the translator’s performance and service quality. For on-site and in-person interpretation services, Stepes also offers one of the most competitive solutions since we use locally based interpreters. This gives us a significant over our competitors because no travel costs apply. Stepes uses patent pending location-based translation services to provide you with reliable translations that you can trust. Our hand selected translators and interpreters are able to provide you with the most accurate language services. For example, if you are visiting Shanghai and need local information in Mandarin, there is no better person to ask then a true Chinese speaking Shanghai local. Our this services are based on LBS and therefore available anywhere and anytime. There are numerous examples of people who travel to other countries and become lifelong friends with local tour guides or people they meet during their trip. Having the ability to hire your local translators and meet them in person will give you the opportunity to make friends across cultures, in addition to learning about local foods, histories, and customs. Stepes allows users to get connected with local bilingual people in a natural and spontaneous environment so you can bond and develop global friendships.